Key skin nutrients to cool & calm sensitive skin. PAW Calming Gel is really easy to use as you apply it by gently rubbing it into your dog's skin and the oil free gel absorbs easily and quickly which makes your canine companion less likely to lick it off. PAW TriDerm Calming Gel is suitable for the most sensitive skin. We use this product on our dog Pluto's tummy rashes and hotspots and it's done wonders, giving her quick relief and reducing redness. The PAW range is made from the finest quality nourishing naturally based ingredients, certified organic where possible, and chosen for their purity and pet friendly compatibility. Concentrated Cerasine® skin nutrient complex: with ceramides and essential fatty acids (omega oils) to intensively nourish the skin for optimal skin hydration and a healthy skin barrier. Aloe, chamomile & vitamin B5: to cool and calm sensitive skin and paws. Our boy had been nibbling and licking his belly red for a few months, and although paw paw ointment seemed to temporarily sooth his discomfort, he still very quickly wanted to bite and scratch it again. And it is never nice seeing your dog in discomfort and/or hurting themselves. 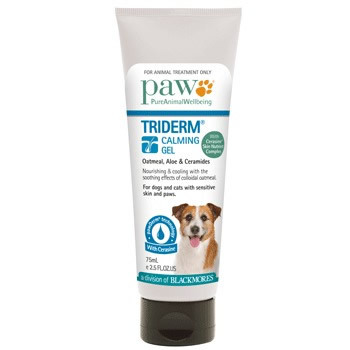 Read 2 customer reviews of PAW TriDerm Calming Gel. The average customer rating is 5. When I saw reviews for PAW TriDerm Calming Gel it sounded like just what we needed, and it has done wondering in just a week of using it. His belly is no longer red and rashy, and his desire to chew at his tummy is almost gone. The cream is smooth and pleasant smelling and soaks into the skin quickly, which is perfect for an impatient, licky dog. He now has a soft, white belly again (which I didn't think was possible) and spends more time playing and less time fussing with this tummy. This cream works wonder! Very light and easy to apply. The paws are not sloppy with the cream, so nothing will stick to them after you applied the cream. My foxy has sometimes red irritations between her paws, depending on where we walked and this cream helped after a couple of days to calm it down, very good product.